Easily locate any Owner, Property, Unit, or Tenant! Property management offices are busy places. You don’t have time to search for twenty minutes,every time you need to locate information about a Tenant, Owner or Property. That is why you need property management software with easy searches. When we developed the Tenant File software, we thought beyond just getting all of the needed information into a database. Of course that is an important feature of any rental management software, but what good is having all the right information if you can’t find it easily? Easily locate any Owner, Property, Unit or Tenant! We make it easy to find the exact information that you need, with just a few clicks of your mouse. 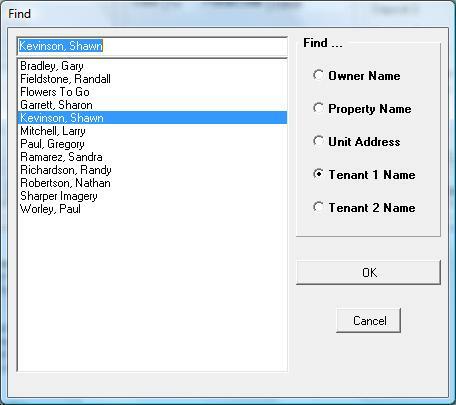 Some real estate property management software assigns codes to Units, Tenants and Owners. That’s all well and good -- until you need to search for something. Instead of being able to search for “John Smith” or “123 Mockingbird Lane,” you instead have to find the codes assigned to the Tenant, Owner or Property, first. Which makes more sense to you? Or, you can find your Owners, Properties, Units, or Tenants by the convenient 'Tree' in the Activities section The Tenant File tree is a handy hierarchy of all Owners, Properties, Units and Tenants. They are listed in alphabetical order, so it is very easy to find exactly what or who you need in a flash. You can hide the tree, or you can choose to only display the Owners, for super fast access. This easy search feature is only one of the ways that our rental management software gives you easy access to information. The software also includes customizable reports and other search features that will make managing all of your properties easier. Don’t go another week without learning more about how our property management software can help you manage and grow your business.